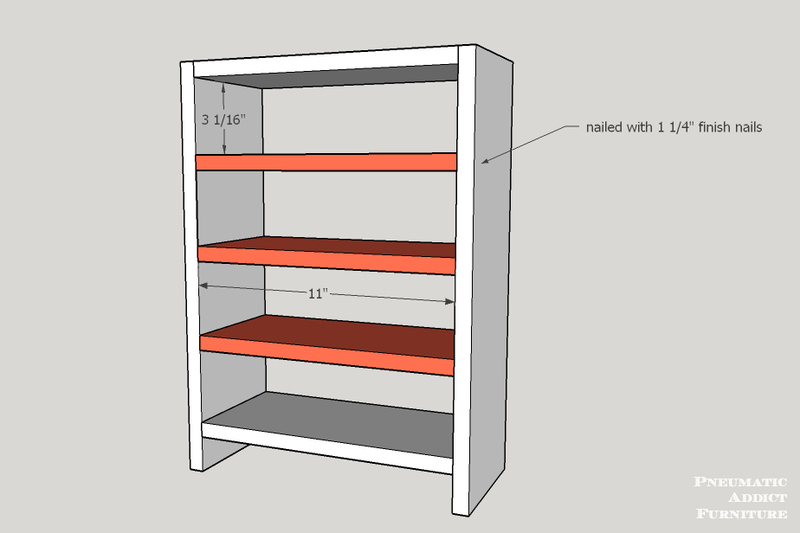 Several months ago, I upgraded my bathroom vanity (I stained the cabinets in this post, and DIYed a concrete countertop in this post), and needed a new place to store my make up. Using some inexpensive cedar fence pickets, and some scrap 3/8" plywood, I built this set of counter-top storage drawers. "Why fence pickets?" you ask. 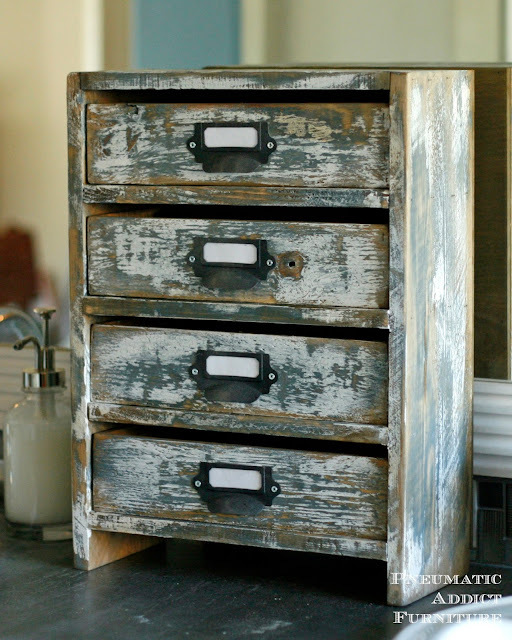 Side from being super cheap, I've discovered the rough texture makes them a perfect substitute for reclaimed wood (I talk about it here), and I dig the "rustic look". Well, almost a year later, these little drawers are still going strong. I figured it might be helpful for many of you to have a set of building plans to reference, so here you go! 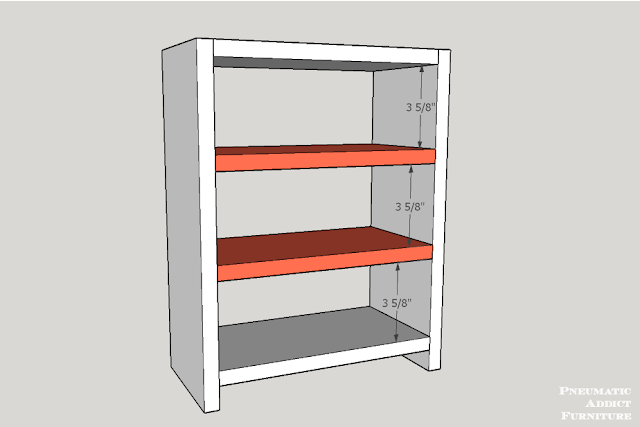 The first set of plans is based on the exact measurements I used, and below is a second, totally different set of plans if you don't want to use a table saw. Just scroll down. Also, if you are one of those people who like to see step-by-step building photos, make sure to check out the original building post for a few more tips. 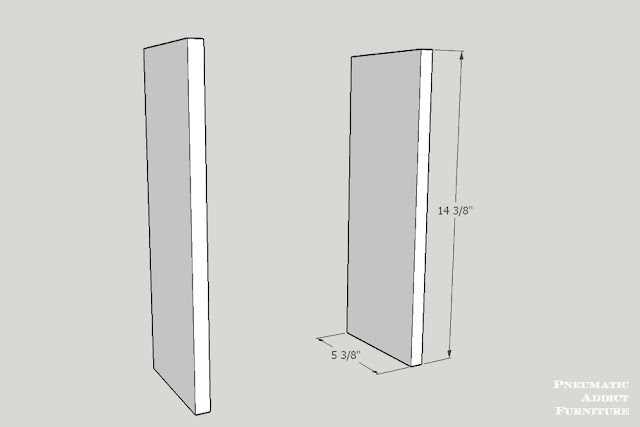 (2) - 5 3/8" wide picket - 17"
(5) - 5 3/8" wide picket - 11"
(1) 1/8" plywood - 12 1/4" x 15 1/2"
(4) 3/8" plywood - 4 1/4" x 10"
(8) 3/8" plywood - 4 1/4" x 2 7/8"
(8) 3/8" plywood - 2 7/8" x 10 3/4"
Start by cutting your two side boards to 17" lengths from the fence picket. Take one, 5 3/8" x 11" wide board, align it parallel and flush to the top of both side boards. Attach with wood glue and 1 1/4" finish nails. Next, measure 1 1/2" from the bottom of both side boards. Align the bottom side of another 11" board and secure with glue and finish nails. 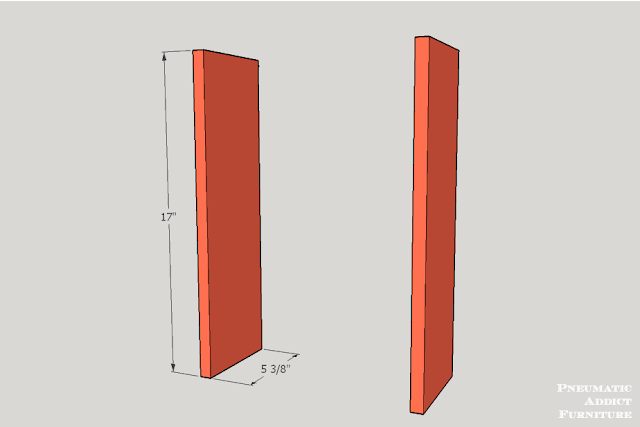 Measure the space between both horizontal boards. Subtract 1 3/4", and divide by 4. That will give you the height of each compartment. It should be close to 3 1/6". 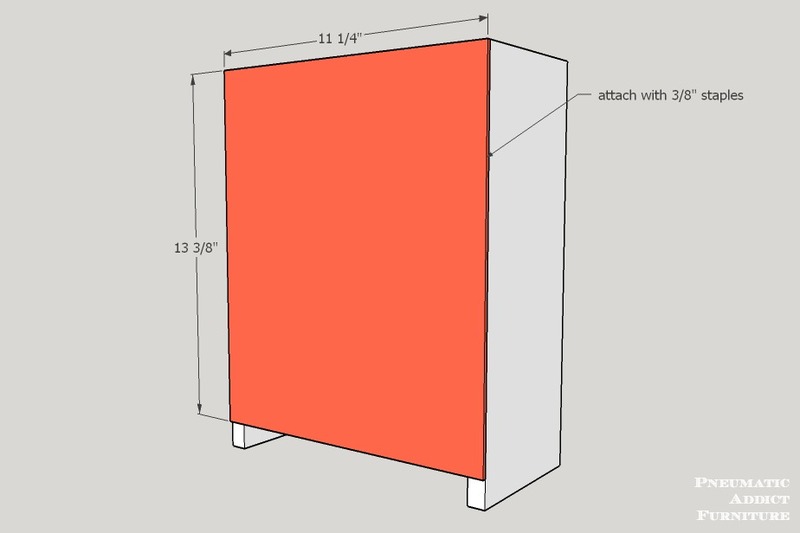 Attach remaining 11" boards, using glue and finish nails, allowing a 3 1/6" space between each one. 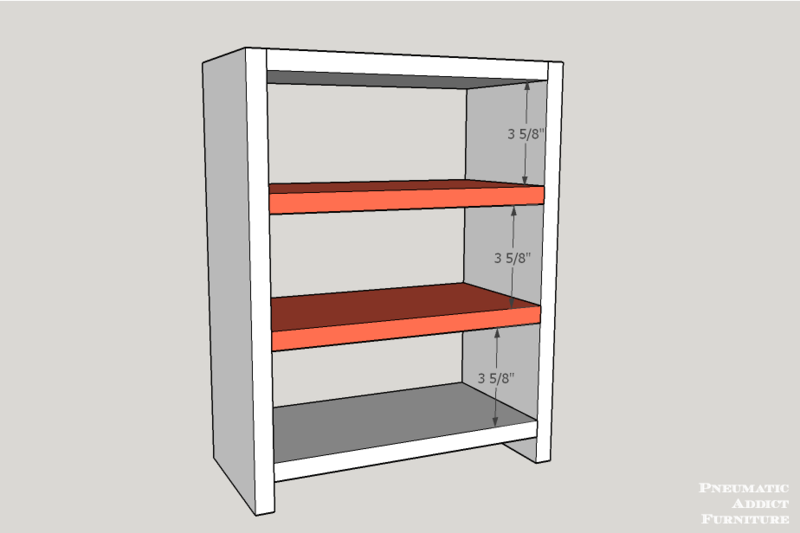 Now, turn the structure around and attach the 1/8" plywood backer board with 3/8" long, heavy duty staples, or small wood screws. 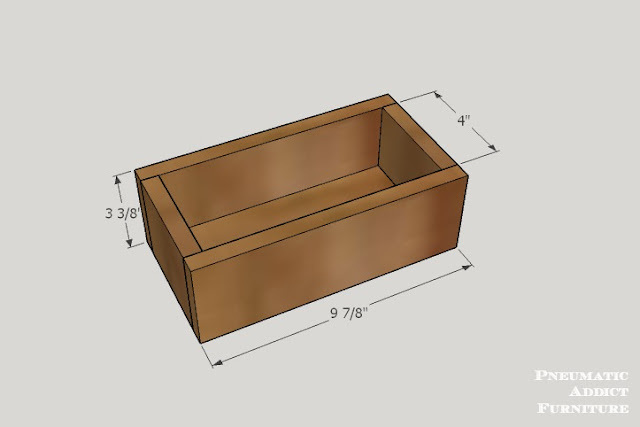 Time to build the drawer boxes. Cut all your pieces from 3/8" plywood. 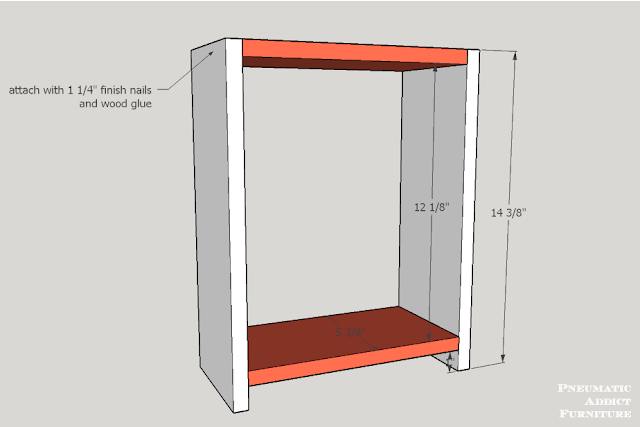 Using glue and finish nails, attach a 2 7/8" x 4 1/4" rectangle to each end of your 10" x 4 1/4" pieces. 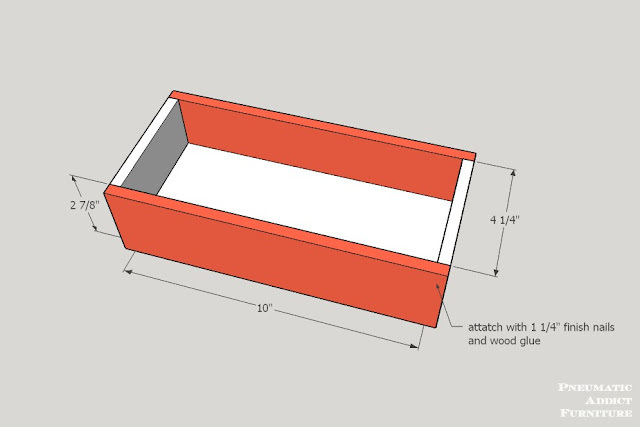 Now, add a 10 3/4" x 2 7/8" piece to either long side, creating a rectangular box. 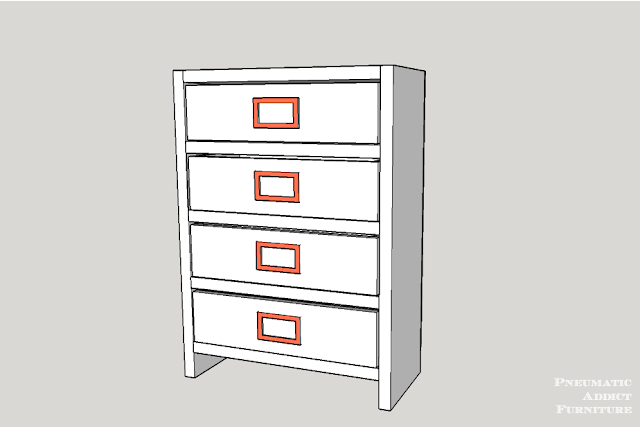 Slide a drawer box into each compartment, and add hardware. I used these label pulls from D. Lawless Hardware (they are only $0.60!) and gave them a little faux patina with some spray paint. That's it! 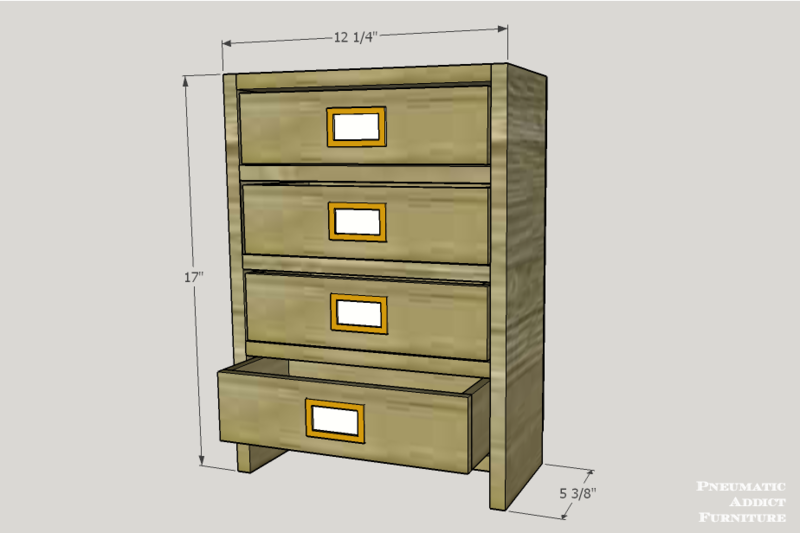 You're now ready to display these little drawers and fill them up with your junk. "But what if I don't have a table saw?" you ask. No fear! I drew up some modified plans, using off the shelf lumber. 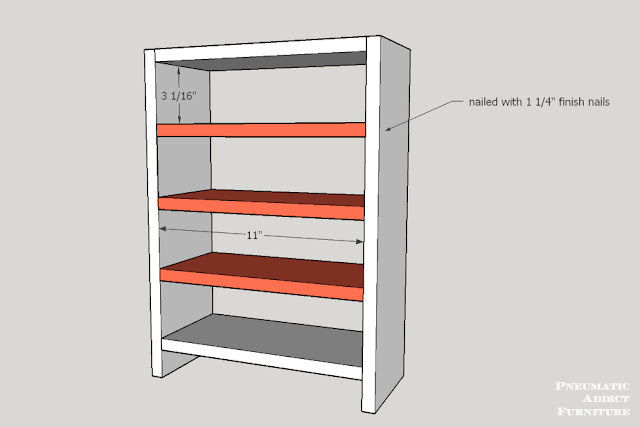 There are only 4 small pieces that need to be ripped down in width, which can easily be done with a jig saw or a circular saw and a couple of guide boards. 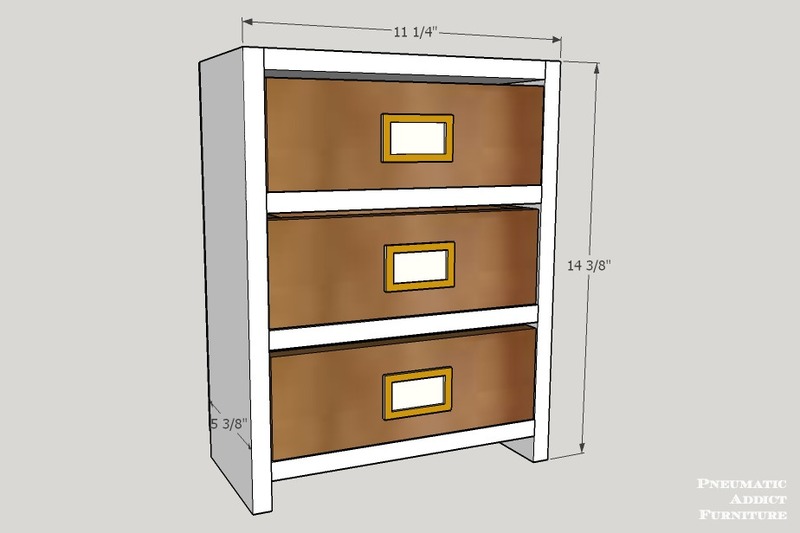 The modified version only allows for three drawers, but still plenty of storage! Check it out. 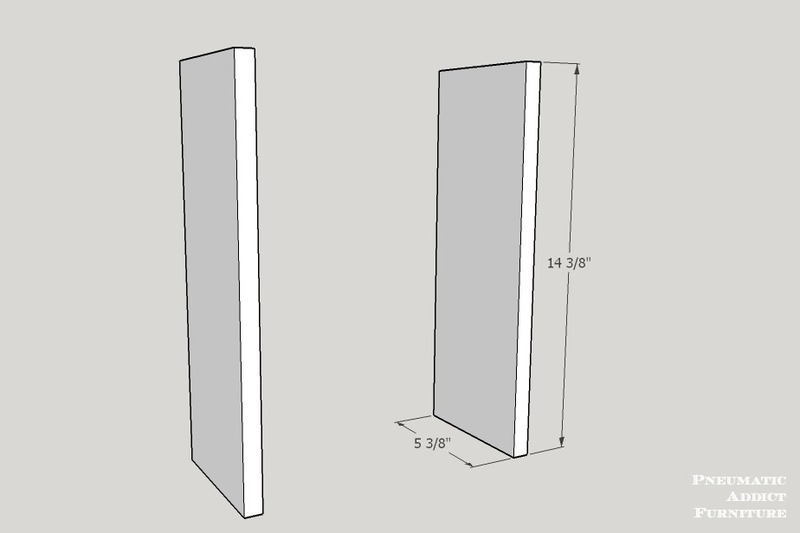 (2) 5 3/8" wide fence pickets - 14 3/8"
(4) 5 3/8" wide fence pickets - 10"
(8) 3 3/8" wide fence pickets - 9 7/8"
(8) 3 3/8" wide fence pickets - 4"
(1) 1/8" plywood - 11 1/4" x 13 3/8"
Start by cutting your two side boards to 14 3/8" lengths from the wider fence picket. Take one, 5 3/8" x 10" wide board, align it parallel and flush to the top of both side boards. Attach with wood glue and 1 1/4" finish nails. Next, measure 1" from the bottom of both side boards. Align the bottom side of another 11" board and secure with glue and finish nails. 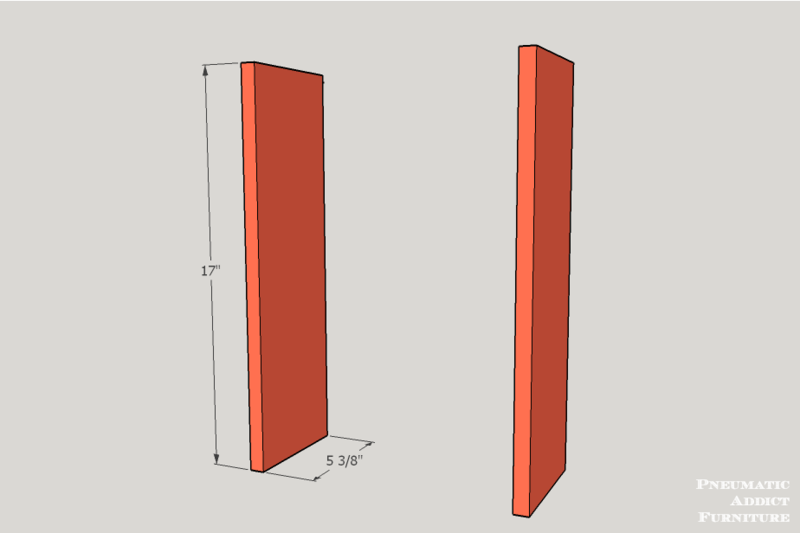 Measure the space between both horizontal boards. Subtract 1 1/4", and divide by 3. That will give you the height of each compartment. It should be close to 3 5/8". 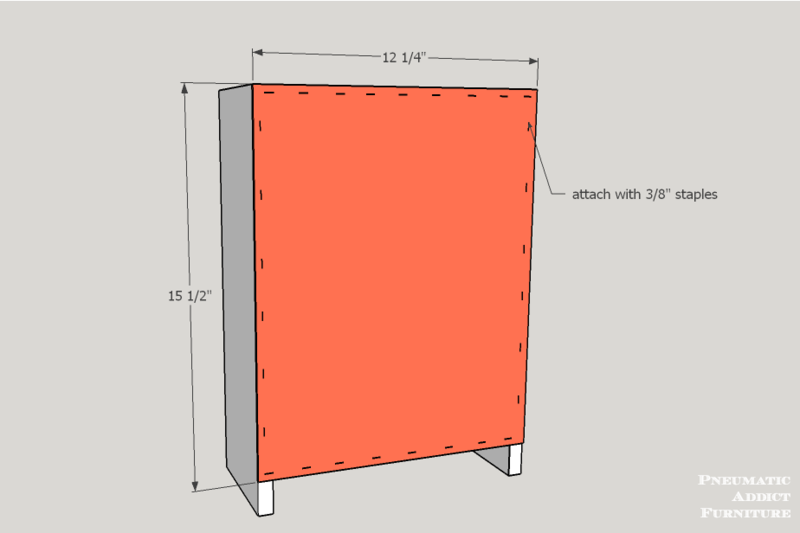 Attach remaining 10" boards, using glue and finish nails, allowing a 3 5/8" space between each one. Time to build the drawer boxes. Cut the sides, front and back from the 3 3/8" fence pickets. 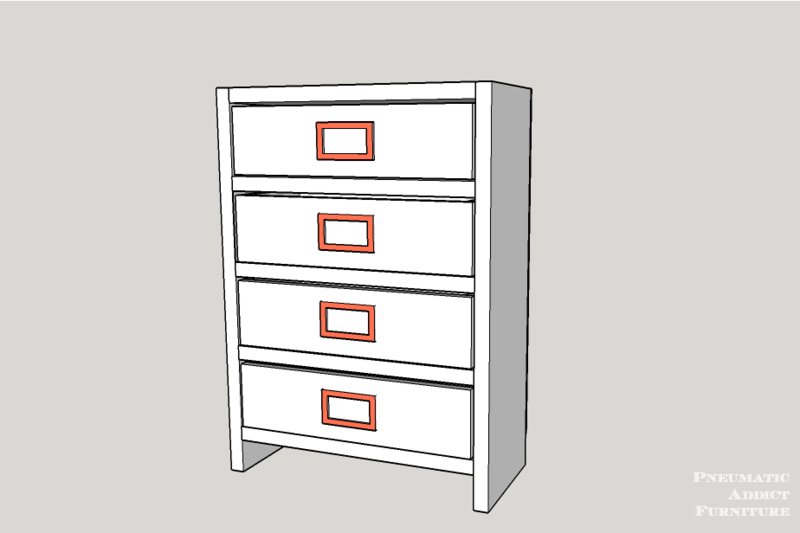 Cut the drawer bottom from the wider fence pickets. 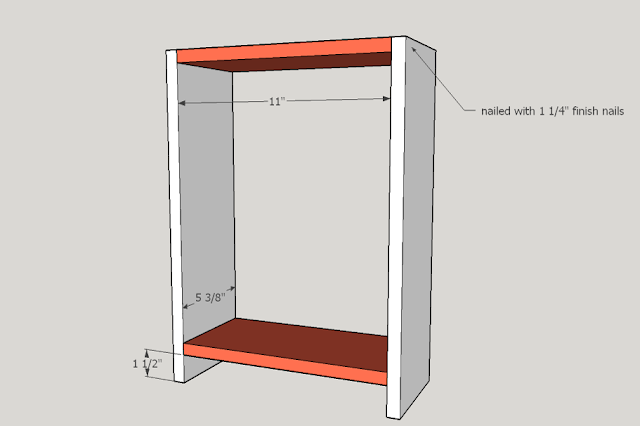 Using glue and finish nails, attach a 3 3/8" x 4" rectangle to each end of your 8 5/8" x 4" pieces. 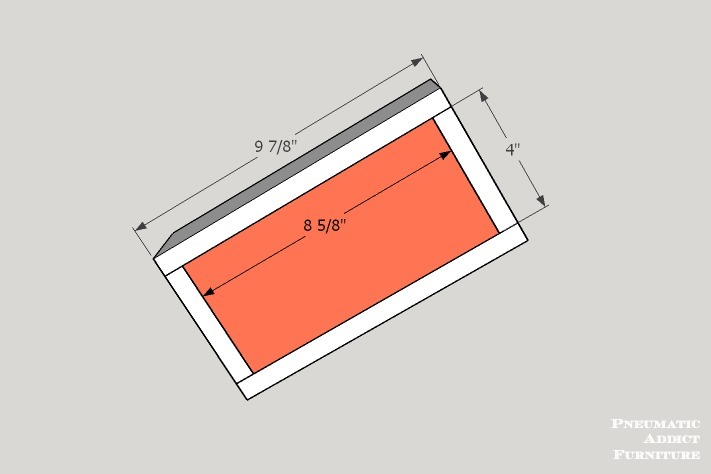 Now, add a 9 7/8" x 3 3/8" piece to either long side, creating a rectangular box. There you go! 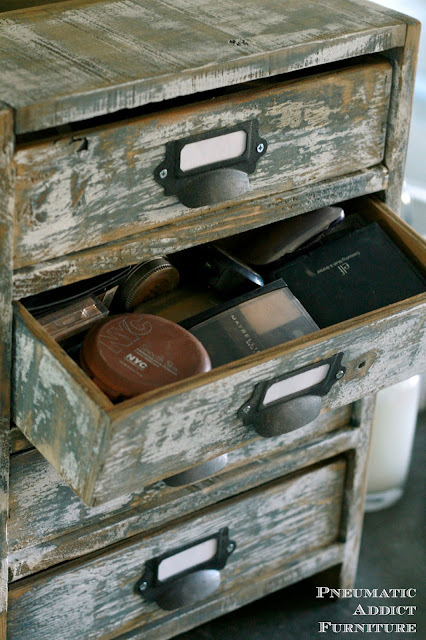 You can now store your make-up, tampons, pencils, etc. in plain sight without it becoming an eyesore. Make sure you read the step-by-step tutorial if you have any questions about the building process or would like to see some close up photos of the assembly. 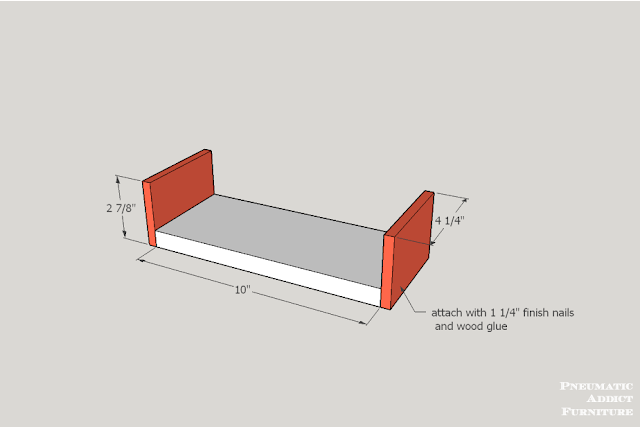 I'm seriously building this asap. I could use one of these in just about every room for various things... LOL! Thank you for the non-table saw version for scaredy cats like myself! Do you have a tutorial on how you did this rugged finish? Love it! Awesome plans Elisha! Pinned, and us no table saw peeps appreciate your extra plans!! Love your project and the finish for this patina lover is just perfection! Thanks Lucy! The finish was so easy. I just did the world's crappiest paint job with two colors and sanded it down.